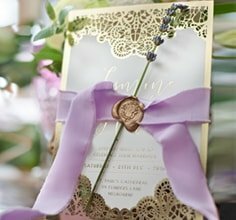 Our wedding invitation pockets will not only impress your guests with its unmissable beauty, but they have also been cleverly designed to keep all of your wedding stationary in the one place, neatly organized for your guests convenience. You can purchase the kits by themselves and print and personalise your own paper inserts which is perfect is you want to add a DIY project to your wedding! With this option, the purchase of the pocket envelopes on their own will be at a reduced price. Giant’s lovely and luxurious range will neatly display all of your wedding details as they were made with complete functionality in mind. The invites are affordable and adorned with crystal embellishments, ribbons, wax seals, dainty lace and laser cut detailing. Here, you will find an array of intricately and impressively produced pouches that boast a well thought out layout to house your cohesive set of inserts. The set will not only stun your guests with its unique look, but your wedding details will be easily managed. For something convenient and cheap but nonetheless sophisticated and stylish, there will be a design to fit in seamlessly with your wedding décor and details. We have brought you an elegant and extensive assortment to choose from, all of which are delightfully decorated.